Sure, entering your transactions into ZipBooks manually is simple. But when you have hundreds of transactions, it can become super time consuming. Make transferring your info to ZipBooks easier by connecting your bank account. Under Transactions, click on Manage Banks. Click on the round green ‘+’ button. In the window that pops up, either click on one of the banks shown, or type the name of your bank in the Search bar. Put in your User ID and Password and click Submit. Choose which accounts to pull information from. 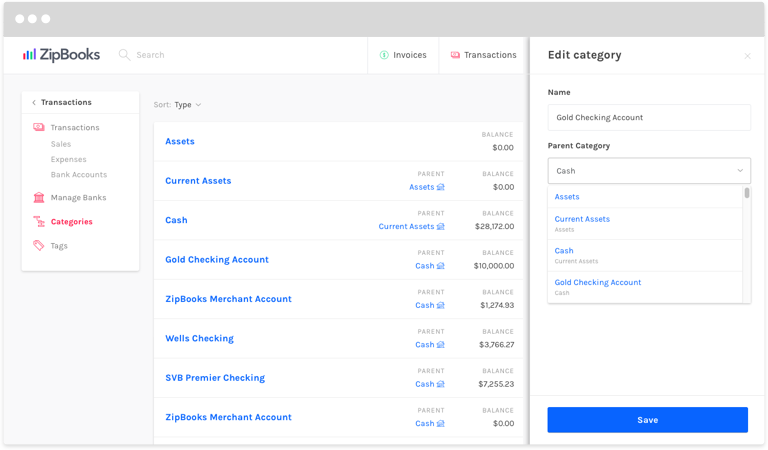 The bank accounts you chose will now appear in your Manage Banks window. If at any time you’d like ZipBooks to stop pulling information from any of your accounts, find the account in your list and simply slide the green button (to the right of the account name) to Off. And that’s it! Now you can save time by letting ZipBooks pull your information automatically. If your bank is not listed, you can easily add transactions to ZipBooks manually. 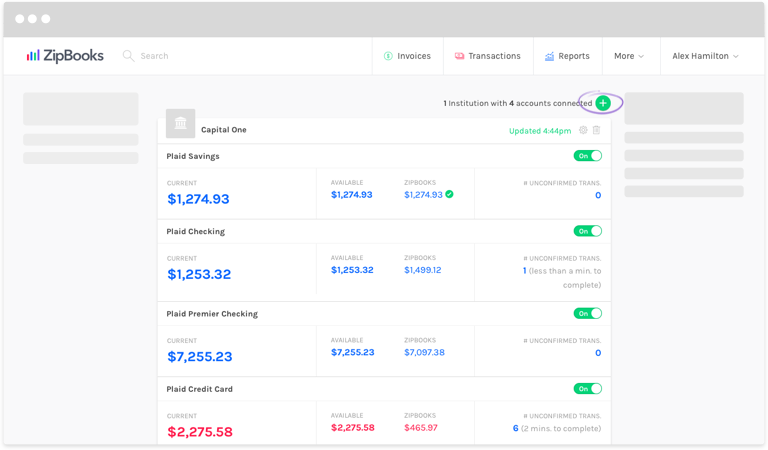 You’ll want to set up a category for your bank account, so those transactions can be grouped together. Log in to ZipBooks and click on Transactions at the top of your screen. Click on Categories in the box on the left. Click the round green ‘+‘ button toward the top right of your screen to add a Category. The Edit Category window will slide in from the right. Put in Checking Account, or Savings Account, or whatever you want the Name of this account to be. In the Parent Category field, choose Cash in the dropdown menu that appears. Or, if you’re setting up a credit card account, use the Credit Accounts category as the Parent. In the Value field, type in the beginning balance of this account (the balance you are starting with before you enter any transactions into ZipBooks). Now your account is active! When you add a transaction into ZipBooks, put this account in the Category field. To add multiple transactions at once, import transactions from a CSV file. While still in your ZipBooks account, click on Transactions at the top of your screen. Click on Categories in the box at the left. Scroll down until you find the Category you set up manually (Checking Account, Savings Account, etc.). Click on it. All of the transactions in that account will appear as a list. You can put in Start and End Dates to filter the information even further. Note: The company we partner with to get banks connected to ZipBooks is always adding new banks. Make sure to check back often to see if your bank is supported. If you’re still having trouble connecting your bank account, please contact help@zipbooks.com or send us a message through the blue chat icon in the bottom right of your screen. How are credit card and PayPal payments recorded in my account?